Chevrolet is a sponsor of the Wreaths Across America program, a program that provides wreaths for the headstones of fallen veterans each holiday season. December 12, 2015 is National Wreath Across America Day, and we wanted to let our customers know a little more about his program and how they can participate! Wreaths Across America was formed in 2007 by the Worcester family of Worcester Wreath Company, who started placing wreaths in the older and sometimes forgotten parts of Arlington Cemetery in 1992. As this tradition took off and more and more people started participating and donating until 2005 when a picture of the wreaths in Arlington went viral and the project received national attention. In 2008, more than 300 locations held wreath laying ceremonies in every state, Puerto Rico, and 24 overseas cemeteries. December 13, 2008 was unanimously voted by the US Congress as “Wreaths Across America Day”. In 2014 Wreaths Across America and their network of volunteers laid over 700,000 wreaths in the United States and beyond. The wreath laying is still held annually on the third Saturday of December. 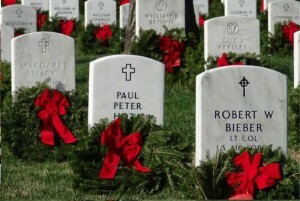 To sponsor a wreath, visit the Wreaths Across America website at: www.wreathsacrossamerica.org. Not only can you donate or sponsor a wreath on their website, you can also add a location for wreath laying ceremonies, or start a fundraising group in your area.